Are you looking for an Interactive Flat Screen? You are looking for a solution that will provide longevity, performance and value. Clevertouch are one of the best Interactive Flat Screens that are available in the market. It carries its values through its high specifications and features that are wrapped in a simple but classy design. Choose the best Touchscreens in the market, installed by Ireland’s leading AV supplier to Irish schools Toomey AV. Checkout our Range of Interactive Flatscreens (IFS) find out more about the CLEVERTOUCH Plus range of Interactive Flatscreens. CLEVERTOUCH are Interactive Touchscreen Displays for Education. Clevertouch Interactive Touchscreens are changing the way we educate our pupils a durable alternative to interactive Whiteboards and Projector solutions. 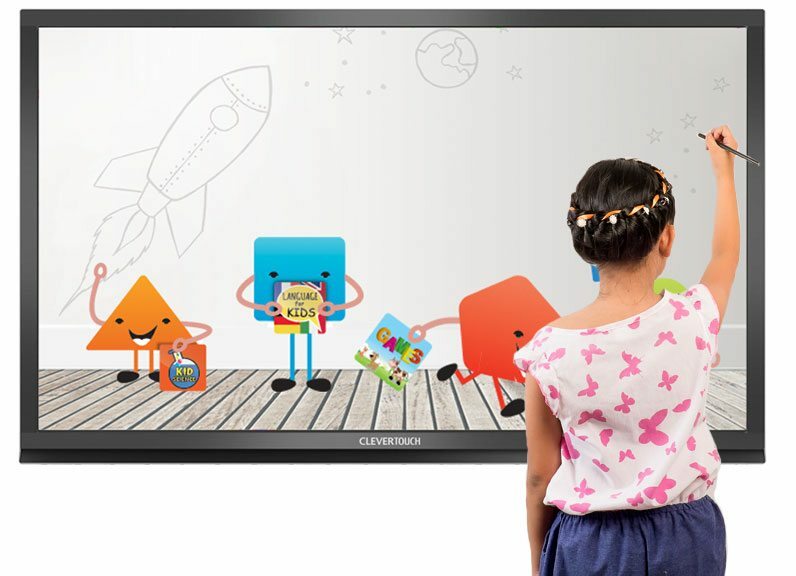 CLEVERTOUCH comes with a variety of education software (Cleverlynx, Displaynote, Snowflake, Clevermaths and Clevernote). All software is easy to use and is child and teacher friendly! We at InteractiveFlatscreens.ie are proud to install the Clevertouch Plus Series range in a growing number of forward-looking schools in Ireland. Check out a case study on how one school benefited from an interactive touch screen. The Department of Education through PDST Technology in Education have drawn up an evaluation and comparison document to help schools with regard to Interactive Flat Screens (IFS). We also supply bespoke training for most educational software packages. Interactive Flatscreens.ie supply professional education-focused training for all Interactive solutions. Interactive Flatscreens (IFS), Interacitve Whiteboards (IWB’s) and Interactive Projectors. Training can generally be provided nationwide. They were also able to organise training for all staff & individual teachers at our convenience. We found the training sessions to be very practical and catered for our needs. I wouldn’t hesitate in recommending Toomey Audio Visual to any other school. Grainne O Reilly, Teacher and ICT CoordinatorLucan Educate Together, Lucan, Co. Dublin. We have been delighted with the demonstration provided. There were lots of good tips given and a thorough explanation of all its features, particularly those newly available since the software upgrade. The demonstrator was friendly, helpful and practical. Thank you very much! Toomey Audio Visual were very efficient in organising the installation and my training. The installation was extremely neat and the technician took great care to hide any wires from view. Susan LevisRathmichael School, Shankill, Co Dublin.